Most of the software we write that flies in space is written in SPARK, a subset of the Ada programming language that supports program verification. With the use of appropriate tools SPARK programs can be mathematically proved free of runtime error and they can have other correctness properties proved as well. Our basic low earth orbit CubeSat uses the SPARK 2005 language. As far as we are aware our CubeSat is the first spacecraft of any kind to use SPARK (although other spacecraft have used Ada). We should note, however, that some of the low level drivers and a third party library for manipulating our SD card are written in C. We hope to minimize the amount of C in future missions. Our software makes no use of an operating system but instead runs on the bare metal. The SPARK code was compiled with all checks suppressed, which we felt was justified by using the SPARK tools to prove the program free of runtime error (see below for more information). This also allowed us to eliminate the Ada runtime system from the executable, saving space and further reducing the amount of unproved code used. We used the Texas Instruments MSP430 microcontroller due to its exceptionally low power consumption and our prior experience with it in the Alaskan Ice Buoy project. Unfortunately when we started our project there was no Ada compiler available for the MSP430. Thus we used a tool chain, shown at right, that converted the SPARK to C using SofCheck's AdaMagic compiler. We then compiled the C, along with the required low level drivers and libraries, to MSP430 object code using Rowley Associates' CrossWorks. The primary Ada development was done using the GPS integrated development environment from AdaCore. GPS supports integration with SPARK and the GNAT Ada compiler was used for compiling and running tests. 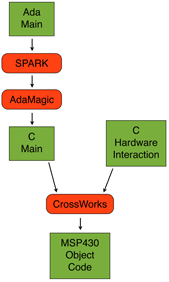 AdaMagic was only used to generate the final flight software via CrossWorks as described above. The SPARK portion of the flight control program consists of 5991 lines of code and 4095 lines of comments (where 2843 comment lines are actually SPARK annotations), for a total of 10,086 lines. These numbers do not consider blank lines. The SPARK 2005 Examiner found the code base free of flow errors but issued 72 warnings, mostly related to automatically generated loop assertions. The Examiner generated 4542 verification conditions (VCs) of which all but 102 were proved automatically. Thus 98% of all VCs were proved. In this project we attempted to prove the program free of runtime errors (to support our decision to suppress all checks) but we did not specifically attempt to prove any higher level properties of the program. Also due to lack of time before launch we did not pursue the remaining 102 unproved VCs either formally, for example with the checker tool, or via focused testing. The C portion of the flight control program consists of 2239 lines (including blank lines). This does not include the header files or source files of the third party SD card library. Thus the C portion of the flight control program is approximately 18% of the total. However that number is somewhat inflated because the count of C source lines above includes blank lines. The final executable consumes 3874 bytes of RAM (not including stack space) and 45,428 bytes of ROM. On our processor this corresponds to 47% of the RAM and 38% of the ROM. These numbers include the space consumed by the third party SD card library we used. No attempt was made, however, to analyze stack space consumption.